JACKSONVILLE, Fla. -- Every time Mikel Leshoure looked up Sunday, including on his three touchdowns, there was Riley Reiff paving the way. 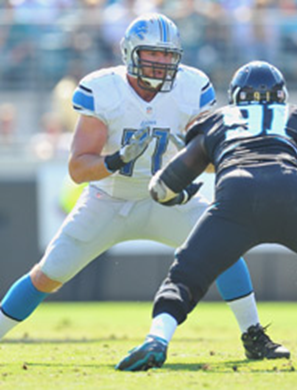 Reiff, the Lions' first-round pick out of Iowa, continues to see his role expand as the team's sixth offensive lineman. He played at least 26 snaps in Sunday's 31-14 win over the Jaguars, had several devastating blocks in the run game and was on the field for all four of the Lions' touchdowns. "Riley's a beast," said Leshoure, who became the first Lion to rush for three touchdowns in a game since James Stewart in 2000. "I just told him that (in the locker room after the game). He's a monster. He doesn't complain about playing time. When he gets in, his number's called, he do what he has to do. And we're happy to have him on our team." Reiff lined up as an extra right tackle on Leshoure's first touchdown, a 7-yard run 3 minutes into the second quarter. He walled off his defender as Leshoure crossed the goal line standing up and was the first to congratulate him in the end zone. On Leshoure's second touchdown, a 1-yard run midway through the second quarter, Reiff motioned left as an H-back, then pulled back across the line of scrimmage with a punishing block on Kyle Bosworth to give Leshoure a clean lane to run through. He lined up as an extra right tackle and backside blocker on Leshoure's third touchdown, an 8-yard scamper in the final seconds of the first half, and served as a front-side H-back on Joique Bell's 10-yard cutback run with 2:42 to play. While Reiff still hasn't cracked the lineup as a full-time starter, Lions coach Jim Schwartz said he has become a staple of the offense. "It's part of what we do," Schwartz said. "He does a good job blocking point of attack, he does a good job blocking on the edge and he does a good job pass protecting when we call passes with it."